No offense to other hipsters, but sometimes you can be real jerks. Last week at my retail job, I was helping a customer purchase an accessory. Being the ever observant hipster, I noticed that he was wearing a Dogfish Head Brewery hat. I love Dogfish Head Brewery. I’ve been there a few times, I drink their beer all the time, I’ve read the books written by the founder Sam Calagione, and last year I was even able to have Sam give a taste to one of my home brewed beers. All this to say that I was happy to see someone wearing a Dogfish Head hat. 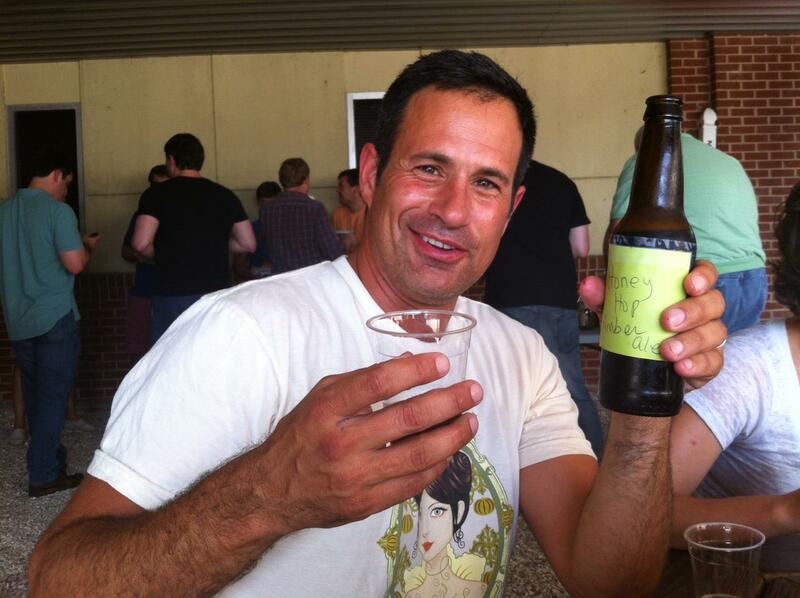 Sam from Dogfish Head tries my home brewed Honey Hop Amber Ale. As part of the ringing out process, we like to email receipts to the our customers. This hipster’s email had the phrase “hop head” in it, which is beer jargon that refers to a person’s love of extra hoppy beers (hops are the ingredient in beer that gives it a bitter finish, and as such it is somewhat of an acquired taste). In noticing his email, I asked him if he was a fan of Dogfish’s 90-Minute IPA (an extra hoppy beer). “Three places…” and he listed off three local breweries, each of which indeed makes a good beer. But that’s not the point anymore. If you “brew professionally” at three different places, it means you aren’t good enough for any of those places to hire you full time. It means you don’t do as much brewing as you do mopping. It means you do exactly as your told and nothing more and nothing less. It means you have nothing about which to be arrogant, rude, or condescending. Sure, all hipsters are arrogant or rude or condescending about something. But most of them have at least some right to be so. If you shave with a straight razor: be proud of that. If you built your own fixed-gear bicycle: be proud of that. If you can taste the subtle notes of goji berry in your single origin french-pressed coffee: be proud of that. I brew my own beer, it tastes really good, and I’m proud of that. I also notice (as I reread this post) that I am proud of my ability to spot jerks in the wild, and I do so with such arrogance and condescension that I have removed my ability to speak about the above-mentioned multi-tasking hop-loving brewer extraordinaire. So I’ll stop right here and give a half-hearted apology, knowing that somewhere someone will be writing a blog about a rude and arrogant hipster they met, and it might just be me. This entry was posted in Rants and tagged beer, Hipster, homebrew. Bookmark the permalink.